To reach Lac Des Roches from the 100 Mile House area, turn east off Hwy #97 at 93 Mile on to Hwy #24. Travel east on Hwy #24 for 50km to reach the west end of the lake. To reach Lac Des Roches from the Thompson Okanagan, take the Yellowhead Hwy #5 north from Kamloops and then turn left (west) onto Hwy #24 at Little Fort. Resorts & Campsites: Resort accommodations, boat rentals and other services along with a BCFS campsite with boat launching are available. Fishing Report: Trolling for rainbows up to 7 lbs. seems to be the preferred method on Lac Des Roche, however, local anglers say this lake may have one of the best mayfly hatches in the region. So get out your fly rod and tie on one of your favorite mayfly immitations. 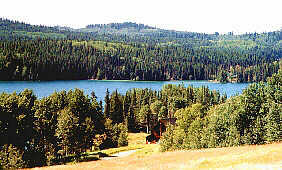 Viewscape: Situated in mountainous terrain, Lac Des Roches is forested in an open Douglas fir and aspen forest with some grassland on the north side. The south side is a denser spruce and Lodgepole pine forest. This beautiful lake contains many islands. Shoreline: Except for a few peaty soil areas, the majority of the area consists of forest soil. There are few sandy beaches around the lake. The north side is accessible with only a few scattered alder stands, however, the south side because of its dense spruce and lodgepole pine forest is less accessible. Wavey Lake: Located just north of Lac Des Roche, this small lake is a high producer of 1 to 2 lb. wild stock rainbows. Spinning, trolling and fly fishing all meet with great succuss. 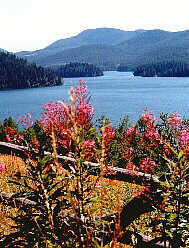 Other lakes in the immediate Lac Des Roches area include King Lakes, English Lake, Friendly Lake, Montana Lake, Phinetta Lake and Birch Lake. Explore them all, it will be very worth while.